Drain field design is arguably the most important aspect of septic performance in Tampa, FL. One of the risks that any business faces with their septic system is a failure that was simply unpreventable. Over the years, roots can impede the flow of liquid and waste from the building to the septic tank, and other times, system components simply fail. Of course there are other times when septic systems in Tampa, FL fail because of improper drain field design – but this is an issue that is 100% preventable. Size – Especially in the commercial industry, a septic tank and subsequent drain field design should be apt to handle the amount of water flow produced on the property. Location – One of the issues facing a commercial septic system installation is finding the best location for the components and drain field. Heavy equipment and constant traffic can damage the components of the septic system, so high-traffic areas should be avoided. Soil – Drain field design should take into account if the soil is suitable for filtering the water produced. Compromising of any of these details (among others) with drain field design could lead to a septic system failure. In a commercial setting, if the septic system fails, it means the business must close; therefore, it’s important to work with an industry leader from our team at Southern Water and Soil to prevent these issues from occurring. 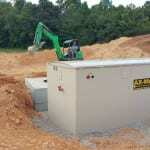 We are experienced in not only the installation of septic components, but the engineering side, as well. At Southern Water and Soil, we offer drain field design services in Tampa, Odessa, Lutz, Land O’ Lakes, Brandon, Orlando, Plant City, Dade City, Bartow, Lake Wales, and Lakeland, Florida.